EARTH Day in Maine’s INN by the Sea! Cape Elizabeth, Maine, March 7, 2013 –– Inn by the Sea is Maine’s premier luxury beach resort and only Virtuoso property, boasting dramatic Atlantic views, the soft white sand of Crescent Beach, and one of the “greenest” resumes in New England. Earth Day on April 22 is always an occasion at Inn by the Sea, which has Maine DEP Green Lodging and Silver LEED® certifications and has been lauded as one of TripAdvisor’s Top 10 Environmentally-Friendly Accommodations and a Top 10 American Green Hotel by MSNBC. To celebrate Earth Day 2013, Inn by the Sea is reaching out to the local community and welcoming busloads of Portland area school kids to sandy Crescent Beach. While the kids are coming to help clean up the beach after a long winter, Inn by the Sea believes that educating them is even more important. That’s why the Inn has arranged for an Audubon spokesperson will talk to the children about the endangered Piping Plover, as well as the importance of protecting and preserving the sand dunes for erosion and wildlife habitat. Creating a “Rabbitat” for endangered New England Cottontails by removing invasive non-native species and re-planting the area with indigenous shrubs. Creating a habitat for migrating Monarch butterflies. First hotel in Maine to build a LEED certified spa, heat with biofuel, be carbon neutral; first hotel in New England to have dual flush toilets. Click here for a detailed list. Chef Mitchell Kaldrovich of the Inn’s Sea Glass Restaurant, a leader in Portland’s regionally sourced food scene, is on the steering committee of the Gulf Of Maine Research Institute’s Sustainable Seafood Program. Editors Note: Earth Day interviews can be arranged with Rauni Kew. A short (1:31 second) video with Rauni Kew on Inn by the Sea’s green policies is available and can be downloaded for editorial use. High-res images of the Inn, the gardens, and Chef Mitchell Kaldrovich are also available upon request. Most major carriers fly into Portland International Jetport (PWM). JetBlue has non-stops service and great low fares from JFK, only 45 minutes flying time from New York. The Inn is a two hour drive from Boston and Amtrak offers rail service into Portland from Boston, New York and Washington D.C.
Cape Elizabeth, Maine, December 17, 2012 – There’s nothing like storm watching along the Maine coast, especially from the sanctuary of a luxurious new Beach Suite with a sea view, a roaring fireplace and a soaking tub. Inn by the Sea, Maine’s premier luxury coastal resort on scenic Cape Elizabeth, has combined all of these elements to create their Winter Warmer package. Remarkably few inns and hotels have rooms with a fireplace, and fewer still have dramatic sea views. Inn by the Sea offers both to those lucky enough to escape to the Maine coast this winter. The Winter Warmer package offers a dramatic ocean view, a fireplace, and a soaking tub in one of the Inn’s new 700-square-foot Beach Suites overlooking Crescent Beach. Guests receive a warm welcome drink and a new pair of L.L. Bean “Wicked Good Slippers,” as well as a Casco Bay Hot Stone treatment at the SPA and Chef Mitchell Kaldrovich’s cheese fondue in the Fireplace Lounge. Guests may never want to leave the premises. But if they do, dynamic downtown Portland is just a 15 minute drive away. As if the sea view, fireplace and soaking tub in the new Beach Suite weren’t enough to inspire a coastal Maine getaway, the Winter Warmer package offers more than $100 in savings. Two nights in a one-bedroom Beach Suite, with an ocean-view, fireplace and a soaking tub in an oversized bathroom. The Winter Warmer package is priced at $515.62 per night, based on a minimum two-night stay and double occupancy. The package is offered from January 2 to March 31, 2013. Cape Elizabeth, Maine. September 26, 2012 –Fall is one of the most exciting times at coastal Maine’s Inn by the Sea, overlooking the Atlantic on mile-long Crescent Beach in Cape Elizabeth. This is when Chef Mitchell Kaldrovich of the Inn’s Sea Glass restaurant celebrates Maine’s bounty by sourcing and creating his autumn menu. As one of the leading lights in the cutting edge food scene of greater Portland, just 15 minutes away, Chef Kaldrovich has made Sea Glass into one of the area’s most celebrated tables. “My aim is to be light and fresh, to enjoy Maine’s natural flavors, and to let the food speak for itself,” says Chef Kaldrovich, who will join other local chefs in the Grand Tasting this fall at the 5th annual Harvest on the Harbor, Portland’s annual festival that celebrates Maine’s farm-to-table movement from October 24 to 27, 2012. For Chef Kaldrovich, fresh seafood, local produce, and farm-to-table practices are the essential ingredients in his kitchen. This fall, he’s using local Maine apple cider for his signature Apple Sparkler cocktail, made with Cointreau and prosecco. Those apples appear again in and Apple Upside Down cake and in a Romaine Hearts & Local Apple salad. Chef Kaldrovich uses cheese from nearby Pineland Farm in New Gloucester, Maine to create a cheese fondue and serves it with Maine apples on the side. As an homage to Maine’s seafood bounty, he serves Gulf of Maine scallops on a butternut squash puree, accompanied by fried Brussels Sprouts, Toasted Hazelnuts and a Sherry Cider Gastrique. The Fall Harvest package is available 10/1/12-11/30/12 and is based on two person occupancy. A two-night minimum applies. Liquor and gratuities not included. Advanced dinner reservations strongly recommended. Visit Inn by the Sea for details. 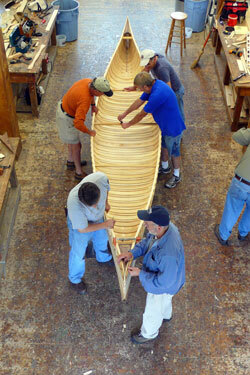 Students work on a cedar-and-canvas canoe at the WoodenBoat School in Brooklin, Maine. Credit: WoodenBoat School. The WoodenBoat School in Brooklin offers six-day to two-week long courses on seamanship, boatbuilding and woodworking, boat design, sailmaking and rigging, oar making and other related crafts. Maine Media Workshops and College in Rockport offers weeklong photography, filmmaking, digital production, bookmaking and graphic design courses for beginners to professionals. There’s a lot more than fiddle music at the Maine Fiddle Camp in Montville. The camp for all ages and ability levels also teaches traditional guitar, piano, banjo and accordion tunes of the region through classes, workshops and evening jam sessions. There is a weekend camp in June and weeklong sessions in July and August. Hundred’s of outdoor lovers from Maine and beyond have taken courses at Maine’s Outdoor Learning Center (MOLC) to aid them in becoming a Registered Maine Guide. MOLC offers weekend and weeklong courses that provide the knowledge needed to pass tests for all guide classifications. Frequent backpackers, campers and people who work in the outdoors can benefit from map and compass/GPS, and wilderness first-aid courses. Where are the best beaches in Maine for sea glass hunters? Tidepool treasures and sand dollars are fun, but pieces of tumble-worn sea glass are the star finds of Maine beachcombers. The beaches of Peaks Island in Casco Bay, Fish Beach on Monhegan Island and Mackerel Cove on Bailey Island are dependable sea glass destinations. SpringPoint Beach in South Portland provides a lighthouse view, while LincolnvilleBeach and Lubec’s Mowry Beach are promising stretches of sand away from crowds. For more information about Maine‘s summer events and activities, go to www.visitmaine.com. The inaugural Bands on the Run Half Marathon and 5K on June 24 will feature six live bands on courses through downtown Lewiston and Auburn. Each race course will take runners and walkers along roads, recreational trails and bridges to the finish line at a riverside park. The first Bold Coast Balloon Festival is set to launch Oct. 5-6 in Machias. As many as 30 hot air balloons are expected for the gathering at the MachiasValley Airport which will give visitors a new way to observe the fall foliage colors and blueberry fields of the region. Rates start at $603.68 per night, based on four person occupancy and a three-night minimum. Rates start at $517.51 per night, based on a three-night stay in a two-bedroom Garden Cottage and four person occupancy. A new Ocean View Beach Suite at Inn by the Sea. This summer, Inn by the Sea is dramatically expanding its role as Maine’s premier luxury oceanfront resort with the addition of 10 new Ocean View Beach Suites. Officially opening in July, the luxury one- and two-bedroom Beach Suites (above) overlook a mile of peaceful, pristine sand beach and offer dramatic Atlantic vistas and spacious living areas. Designed to offer an authentic yet modern coastal experience, they will raise the bar for stylish seaside accommodations in coastal Maine. There’s also Inn by the Sea’s new Jazz on the Lawn series, which kicks off on Tuesday, July 3 with the New England Jazz Quintet. Weekly Summer Garden Dinners, served farm-table style, are held every Wednesday evening by Chef Mitchell Kaldrovich of the Inn’s Sea Glass restaurant using the local organic fare from the farms that surround the Inn, as well as the fresh fish brought in daily from the Gulf of Maine waters off shore. From Children’s Yoga on the Lawn to Doggie Happy Hour, there’s something for every member of the family all summer long at Inn by the Sea. The rhythmic crunch of snowshoes provides the perfect accompaniment to an otherwise quiet winter walk in the Maine woods. Snowshoes allow winter exploration in deep snow, up hills and mountains, and to remote spots with great views. Touring centers, farms, and community parks in Maine allow snowshoeing on groomed and ungroomed trails for a fee or for free. Many touring centers rent snowshoes for all ages. Here are just a few of Maine‘s scenic spots for winter exploration. Douglas Mountain Preserve near Sebago Lake has three trails that offer an easy round-trip walk of one to two miles to a scenic mountain top. Take off the snowshoes at the summit to climb the rectangular stone tower which has a map at the top identifying the surrounding mountains and bodies of water. Fort Baldwin State Historic Site in Phippsburg has a hilltop view of Fort Popham and Pond Island Lighthouse. A wide trail leads up the hill, passing three concrete batteries built into the land. Another trail begins at the top of the hill through a pine forest following moss covered rock walls for more than half a mile. in the small central Maine city of Hallowell. The moderate main loop trail is two miles following a stream with a striking arched bridge at the midpoint. Visit one of these public gardens when the warmth of spring reawakens flowers, flowering plants and trees, and woodland ferns. Camden’s Merryspring Nature Center is a 66-acre park open year-round with theme gardens, a 10-acre arboretum with labeled native plants and trees, and a network of trails. McLaughlin Garden in South Paris is known for its 200 lilac plants, grass pathways lined with wildflowers, and wooded spaces filled with ferns and hostas. Wild roses, lilacs, perennials and historic Native American flower species draw visitors toPettengill Farm, a 19th century saltwater farm bordering the Harraseeket River in Freeport. The farm sits on 140 acres just a mile and a half from the shops of downtown Freeport. For more information about Maine’s winter events and activities, go to www.visitmaine.com. Maine is known for some of the toughest terrain on the Appalachian Trail, but it may also have the most relaxing stretch: a 70-yard canoe ride on the Kennebec River in the town of Caratunk. TheKennebec River Ferry is operated by the Maine Appalachian Trail Club and has transported hikers from late May to mid-October since 1987. North and southbound hikers have one or two two-hour windows to catch the boat which has white A.T. blazes on its inside. The Aroostook County town of Loring is now home to the world’s longest and one of the fastest land speed racing venues. The Loring Timing Association hosts racing weekends for cars and motorcycles on two and a half miles of asphalt runways at the town’s former Air Force base. Last summer a racer set a world record by reaching 311 miles per hour on a conventional motorcycle. Races draw competitors from around the United States. Note: Click on the image above or the link below in order to access a downloadable version of photo. Diving News, Events, Maine, Music, Places to Travel, U.S.A. Think Winter? Think the Coast of Maine. Portland, Maine, December 5, 2011 – Winter is one of the very best times for couples or BFFs to cozy up in a luxury seaside resort. Especially with Inn by the Sea’s new Winter Warmer Package, which launches on January 2 and is available until the end of March. Looking out to the moody Atlantic Ocean and Casco Bay, with a warm drink in hand and curled up before a roaring blaze, this is winter perfection. It’s when northern Atlantic shrimp are in season and hard shell lobsters are abundant and sweet. It gets even better when the Inn by the Sea turns up the heat by adding Hot Stone massages at the SPA, two pairs of L.L. Bean Slippers, and plenty of nurturing comfort food from award-winning Chef Mitchell Kaldrovich of Sea Glass restaurant. If that doesn’t warm your heart, try this: Winter rates are about 40 % less than during the peak summer months. Two nights in Spa Suite – ocean-view, duplex room with a Living Room, fully equipped wet bar kitchen, Loft Bedroom, oversized marble bathroom with an air-jet tub and glass walk-in shower and a heated floor. The Winter Warmer Package is reasonably priced at $992.46 per room, for a two-night stay, based on double occupancy. The package is offered from January 2, 2012 to March 31, 2012. Looking for the perfect something for under the tree? Gift Certificates may be purchased online and redeemed for future stays or resort services. MAINE – Maine‘s 12 national and state scenic byways cover more than 500 miles of roadway through beautiful coastal and inland landscapes. Each byway has natural attractions providing detours from a short walk to recreation opportunities that could fill a weekend. Grafton Notch State Park is a destination for many travelers on the Route 26 Grafton Notch Scenic Byway (http://www.exploremaine.org/byways/lakes-mtns/graftonnotch.shtml). The park’s Moose Cave is a boulder cave within a 200-foot long gorge that has 45-foot tall walls. The byway crosses the Appalachian Trail and passes through the 4,000-foot Mahoosuc Mountain Range. Near the northern end of the 78-mile Old Canada Road National Scenic Byway (http://www.byways.org/explore/byways/11510) (Route 201) take the Attean Rd. before reaching downtown Jackman and drive to the public boat launch on Attean Pond. Paddle along the shore on the right until you reach a series of five campsites on sandy beaches. The last of the sites has a trailhead for 2,200 foot Sally Mountain with panoramic views of the island-studded pond and colorful surrounding hills and mountains. Donnell Pond Public Reserved Land provides an oasis of recreation along the Blackwoods Road Scenic Byway (http://www.byways.org/explore/byways/11511/) (Route 182) between the towns of Franklin and Cherryfield. Take a break along the 13-mile byway to paddle in one of Maine‘s clearest lakes, hike small mountains, camp or fish on a secluded pond, or watch for moose, deer, great gray owls or bald eagles. Get a workout in with your leaf-peeping at the 20th annual Maine Marathon, Relay and Half Marathon (http://www.mainemarathon.com/) Oct. 2 in Portland. The marathon and half marathon begin and end beside the city’s Back Cove. The marathon course is mostly flat with rolling hills and heads north into Falmouth and Yarmouth before turning south. The marathon relay is open for teams of two to four runners. The event is a Boston Marathon qualifier race. Another option is the 10th annual Mount Dessert Island Marathon & Relay (http://www.mdimarathon.org/) Oct. 16. The race that was named Most Scenic in North America by ESPN begins in downtown Bar Harbor and snakes through the villages of Otter Creek and Seal Harbor to Northeast Harbor, Somesville and Southwest Harbor. Admire the changing foliage colors with ocean, mountain and forest vistas. For more information about Maine’s fall events and activities go to www.visitmaine.com. A biennial gathering of the world’s top rock sculptors has led to a unique public art tour along Maine’s downeast coast. Granite sculptures created at the Schoodic International Sculpture Symposium have been permanently installed at 12 sites from Deer Isle to Milbridge. The large-scale, free-form sculptures on the Schoodic Sculpture Tour (http://schoodicsculpture.org/tour/) have names like “Transitory,” “Tribute to Life,” and “A glimpse of the moon.” Six new sculptures will be added to the tour following the completion of the 2011 symposium. After nearly 10 years of successful winemaking the owners of Winterport Winery added beer to their product line, opening Penobscot Bay Brewery. And now the Anderson family is using a stout brew to create another product: Bay Brew Ice Cream (http://www.winterportwinery.com/baybrewicecream.asp). Stone Fox Creamery in Monroe makes Half Moon Stout ice cream (tastes like coffee) and Black and Tan (stout base with chocolate swirl) for Bay Brew. Finally, you can drink your beer and eat it too. Portland, Maine, January 27, 2011 — Inn by the Sea is one of the East Coast’s finest luxury beach resorts; the stylish, intimate 57-room coastal gem overlooking Crescent Beach, on the shores of scenic Cape Elizabeth peninsula, the rocky headland just five miles south of downtown Portland. The Inn is an easy 20 minutes from the vibrant downtown arts, dining and shopping scene in what has often been named one of the top most livable cities in the U.S. Inn by the Sea underwent a multi-million dollar renovation in the spring of 2008. It is the only Virtuoso property in Maine and also bears the prestigious AAA Four Diamond designation. This spring the resort will join the Preferred Boutique Hotels group. Travel + Leisure readers named the Inn one of the World’s Best Hotels this month in the January 2011 issue. A complete redesign of the guest rooms, duplex Spa Suites and cottages brings fresh new interiors, done in a rich palette of earthy red hued textiles, warm cognac woodwork and are outfitted with maple furnishings and locally commissioned artwork. Views from the Inn look out to five acres of indigenous seaside gardens, quintessential sunrises and lobster boats anchored off Crescent Beach – the very scenes that inspired great American painters – the masterpieces of Hopper, Homer and others that hang in the nearby Portland Museum of Art. Executive Chef Mitchell Kaldrovich of the Inn’s Sea Glass Restaurant , a James Beard House guest chef in 2010, sources products from local farmers and fishermen, emphasizing Maine’s natural flavors in his cooking and the bounty of resources surrounding the resort. His fresh lobster roll is one of the best in the state, served on a homemade bun with lemon mayo. Click here to view a video of Chef Mitchell preparing pan seared sea scallops in Maine-grown parsnip puree. SPA at Inn by the Sea is a LEED Silver certified spa, the first in Maine, with treatments that evoke an unmistakable sense of place, including signature massages ranging from Sea Waves and the Deep Sea Soother to the Casco Bay Stone Massage and treatments such as the Maine Mud Mask. Specialty treatments make a trip to the SPA right for every type of guest – The Men’s Maritime Facial, The High Tide Teen Facial, The Motherhood Massage for expecting guests and new Moms, and for the VIPS at the Inn (Very Import Pets) a 30-minute in-room dog massage. Perfect for families, the multi-level spa suites and garden suites offer private bedrooms, spacious living areas and oversized baths. The two bedroom seaside cottages are ideal for multi-generational getaways. The Inn offers endless things for kids to do, including learning first hand about the environment through the popular “The Bug’s Life” guided garden experiences where kids get to dress in insect costumes and explore the grounds, nature walks and the summer essential — s’mores by the fire pit. The Inn is a recognized leader in their ability to artfully blend luxury, service and an exceptional guest stay with sustainability. Their winning approach is backed by an unparalleled commitment to the environment and to minimizing the impact of hotel operations through eco-friendly initiatives and deep appreciation of all things local. The five-acre grounds feature a designated Wildlife Habitat, a Certified Monarch Butterfly Waystation and a certified bird sanctuary. Recycled building materials are used whenever possible and the Inn heats with biofuel and the pool with solar panels. Room key cards are made out of compostable, recyclable PVC. Completely biodegradable plastic water bottles will be introduced this spring. Guests are even encouraged to take home their barely used bar of natural olive oil soap. Click here to view YouTube video on the Inn as Green Living Project. As a boutique hotel with just 57 rooms and one of the best restaurants in the Portland area, the Inn is the perfect place for a dream wedding. On an exclusive buy-out basis, couples can host up to 150 people in the banquet rooms or tented on the lawn. With spectacular ocean views from all locations, the Inn provides a dramatic and memorable backdrop for wedding receptions and fabulous wedding photography. The Inn features designated pet-friendly rooms and suites, water bowls, beach towels, cozy blankets, and signature treats at turndown. Grooming services, doggie pet massages, gourmet pet menus, dog walking and doggie day care are also available for additional charges. Yankee Magazine named the Inn “The Best Dog Friendly Vacation Spot in New England” in their May/June 2010 issue and this month was featured as one of the “Top 10 Luxury Pet Friendly Hotels” in FIDO Friendly magazine. The Inn enjoys the best of both worlds; a quiet, seaside location that’s just 20 minutes from the buzzing arts, dining and shopping scene of downtown Portland.